Police in Karabuk refused to comment. Turkish news reports say police want to question a scrap paper collector who used to hang around Istanbul's ancient city walls, where Sierra's body was found on Feb. 2, 12 days after she disappeared. Authorities say she sustained a fatal blow to the head. Sierra had traveled to Turkey to explore her photography hobby. She went alone after a friend who was supposed to join her canceled for financial reasons. 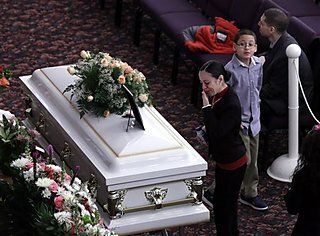 That friend was among about 200 mourners who attended Sierra's funeral at Christian Pentecostal Church on Staten Island Friday morning. In a service that featured several personal tributes, her husband, siblings and friends made clear they found solace in their faith. "My mind is at peace," said her husband, Steven Diaz-Sierra. "I have many questions for the Lord," he said, "but despite how tragically this came about, I know in my heart that my wife is in his presence." Sierra was a member of the church's congregation since she was a child, and was married there in 1998. "Whatever the circumstances of her death, she's with God," and that belief provides comfort, said the Rev. John Rocco Carlo. The pastor said it was one of the most difficult funerals he performed in his two decades at the church, because he had watched Sierra grow up. "It's not goodbye," said her brother, David Jimenez. "We'll see her again someday. Christ promised us that." Still, while they spoke positively of their beliefs, the tributes also acknowledged the heartbreaking loss. "There will always be that missing space in my life, and that missing piece is you," said her sister, Christina Jimenez, as she struggled to hold back tears. "Nothing is the same now, and I doubt that will ever change." Speaking directly to Sierra's sons — Silas, 9, and Sion, 11 — Carlo said: "As we grow older, we become our parents. We look like them, we act like them. We talk and walk like them. "So when you miss your mom, look in the mirror. She's part of you." Following the service, Sierra was buried in a cemetery steps away from the apartment building where she lived with her husband and children.